Do you remember that your first “aha!” moment with a tool? We all have one: that exact moment when a neat trick blows your mind so profoundly, and suddenly you just get it. Using only the basic and obvious features of Nostromo is already enough to make it your best ally in managing your projects, but there’s so much more under the hood of this tool that makes it truly amazing. Below is a list of useful hacks and tips that help you manage and organize all projects and task and make you a true Nostromo pro user. 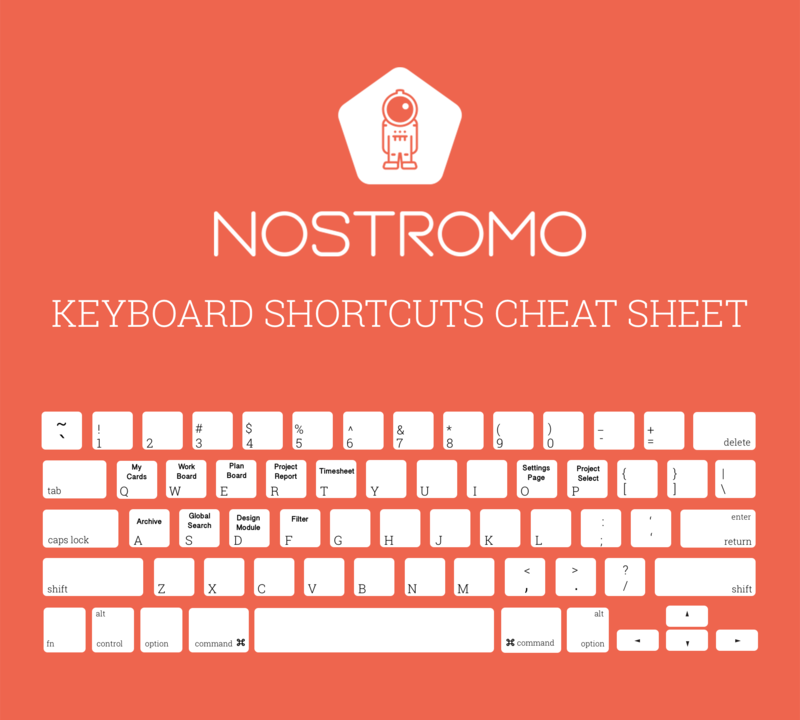 For faster and smoother navigation we packed Nostromo with rad keyboard shortcuts. They let you navigate between boards, search among cards and all kinds of useful stuff with a click of a key. My personal favorite is the “p” shortcut which opens the project selector menu and lets you search for projects instantly. Press “p”, type the first few letters of the project you’re looking for, press enter, and you’re there. It’s the fastest way to switch between projects. Another favorite is “f” which opens the card filter while on a board. You can instantly start searching for cards by title. The filter will also works for members and labels, so you can start typing “da” and it will filter for names starting with ‘Da’. Press enter to see cards assigned to him. On Work & Plan boards, in Designs, in Archive: using ‘F’ will Filter / find cards on actual screen. Use key “S” to initiate an all-round search in Nostromo while key “F” to filter for something on your actual board. Use Filter field on boards (shortcut: key “F”) to initiate a filter by card names, user names and labels added to cards. Filter in Designs (shortcut: key “F”) works based on folder and design file names only. This one is definitely one of our favourite! Eliminate a the constant switching between Nostromo and your Todo list and manage your Todos right inside Nostromo. You can do this in various ways, from various places so you can only focus on the task to be done. On one hand use your Dashboard for creating todos right in the Todos section from scratch or convert a card into a Todo list item right on your dashboard. Also you can create a todo on the detailed card view by selecting ‘Create Todo’ option from the drop down menu. You can create your next project a few click by opening a the project selector menu (using the ‘P’ hotkey 😉 ) and clicking on the ‘+’ icon. But don’t worry you don’t have to! Just use the global search feature in Nostromo to find what you are looking for. You can search in card titles, descriptions, checklists, design titles and in all comments at once with just a press of a button. ( And what button? The ‘S’ naturally). Find the information you need in no time, and save valuable time while you work. Need to get the attention of another project member? You can mention them in a card comment and checklist item and it will generate a notification for them. It’s got autocomplete, too. Just start typing “@” and their name and you’ll get suggestions. Labels are cool. They help you keep organized and well they make your board fun to look at. Also you can search for the labeled cards more easily by using the filter (‘F’ hotkey) feature. Use formatting to highlight important information or just to impress your friends and strike fear in your enemies’ hearts. There. Now you’re a pro. Head back to Nostromo and use what you’ve learned! For more tips, you can follow us on Twitter and Facebook.